A highway diner is the setting for Donuts, a tasty 4 reel video slot from Big Time Gaming that can offer up to 7,000 ways to win. Treats here include Donut boxes that can reveal matching symbols or wild multipliers that can boost payouts by up to 4x. Trigger the bonus round and you’ll receive free spins with potentially even bigger multipliers. Stakes in this volatile game starts at 5p, rising to a maximum of £10 per spin. Big Time Gaming has kept things pretty simple as far as design goes. The reels are set against a desert highway backdrop, complete with a Donut-inspired diner. The lower value A to 9 playing card symbols are joined by a quartet of donuts covered in icing. Top of the payers is the purple and yellow donut which pays 0.4 or 15 times your bet if you land 3 or 4 on adjoining reels. Helping your winning chances is a wild which can appear on reels 2 and 4 only. There are a couple of potentially sweet extras on offer here – first up is the Donut Boxes feature. Keep a special eye out for the Donut Boxes which can appear on any spin and increase the number of ways to win – up to 7,000. 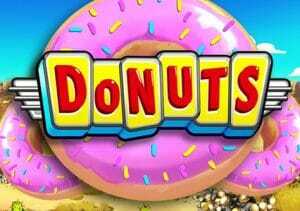 The boxes can open to reveal up to 4 donut symbols or multiplier wilds. These can boost your payouts by 2x, 3x or if you’re really lucky, 4x. Then there’s the Free Spins feature which is triggered by the gold donut scatters – 3 or 4 of them on the same spin will give you 12 or 20 free spins. Before the feature begins, the Bonus Countdown plays out. You’ll get an initial 3 spins on a new set of reels which are made up of blanks and golden donuts. Those golden donuts come with multipliers attached. The spins reset to 3 if a golden donut hits. When you’re out of spins, all the multipliers are added together. These are then carried forward to the free spins proper and they can reach 50x! Landing 2, 3 or 4 free during the feature adds an extra 10, 20 or 30 free spins to your total with no limits to how many you can play with. Donuts probably wouldn’t win a Star Baker award on the design front. It’s tasty enough as far as gameplay goes though. It’s pretty spicy too. This is a volatile game with wins of up to 40,000 times your bet on each free spin. Get lucky with the multipliers in the Free Spins feature and Donuts can deliver some pretty sweet action. If you have sweet tooth, Play ‘N Go’s Sweet Alchemy is worth trying.